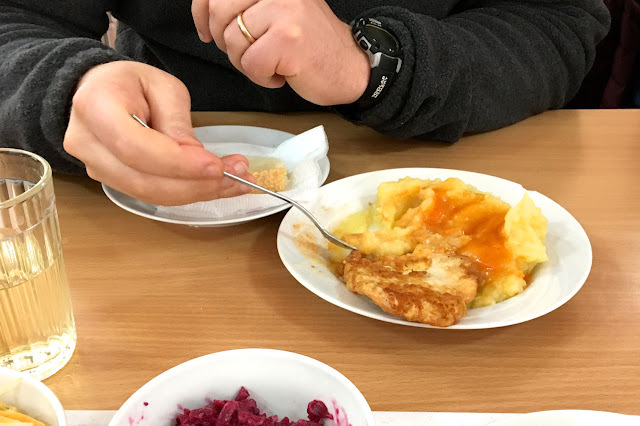 To immerse ourselves in the full Russian experience, Ted and I have been doing our best to eat like the locals. 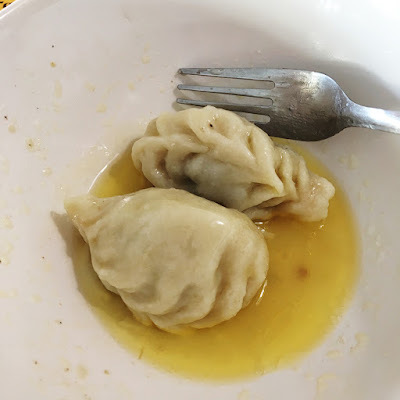 There's too much to say about food for one post, and I'm sure we'll continue to have new food experiences during our stay here, so I'm breaking this post into several entries. 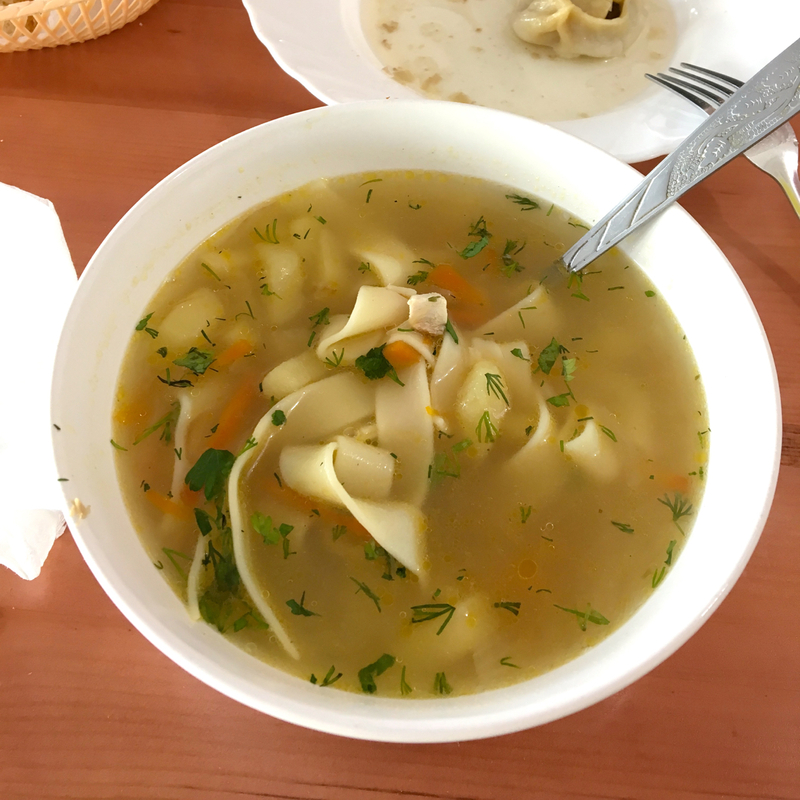 Today I'll talk a little about what we've learned so far about Kalmyk food. The Kalmyks are historically a nomadic population. It was only about 150 years ago that they were settled in the city of Elista. As in all nomadic cultures that I know of, the Kalmyks did not plant crops, so their diet was mostly dependent on meat and milk. There's even a traditional Kalmyk song that goes something like, "As long as you like meat, we like you." 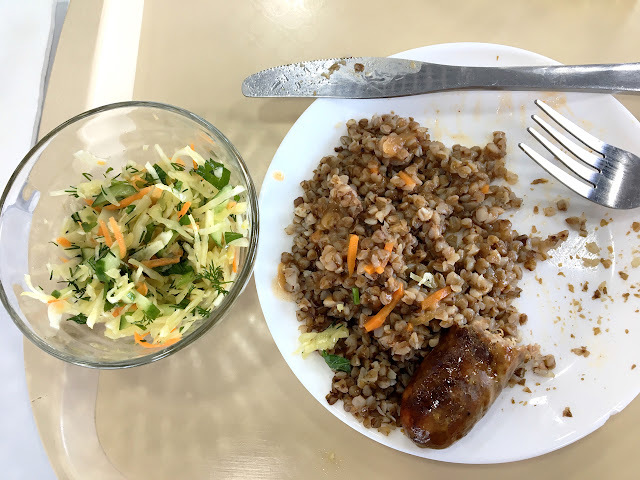 Coming from the United States, where vegetarian and vegetable-heavy options are plentiful, it has taken some getting used to, but luckily the meat is cooked in delicious ways here. one of the things I was most looking forward to about this trip! 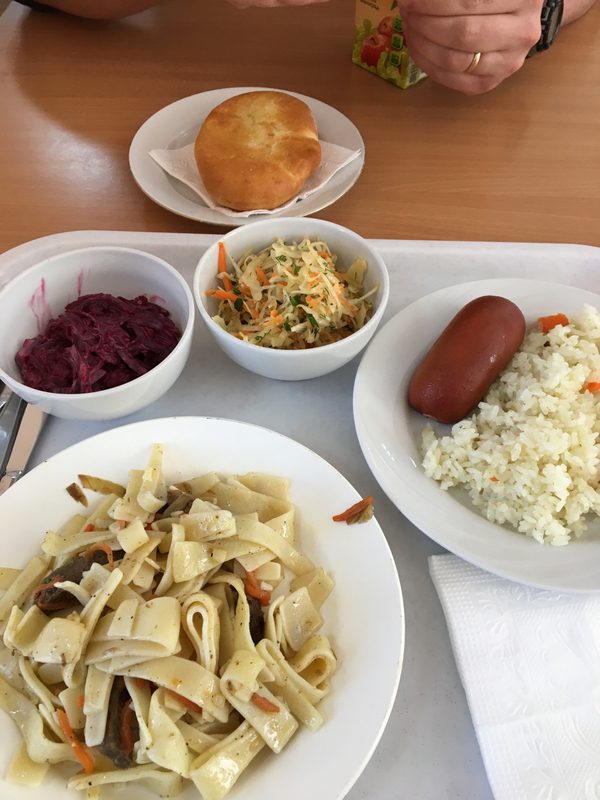 In addition to meat, most meals are also accompanied by Kalmyk tea (mentioned in my first post from Kalmykia) and bread (khleb). 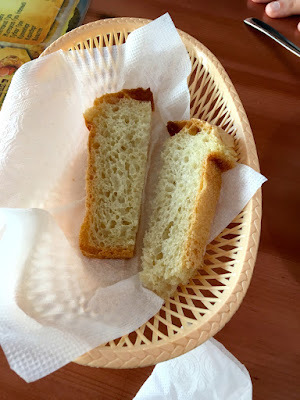 The bread is usually a spongey sourdough. 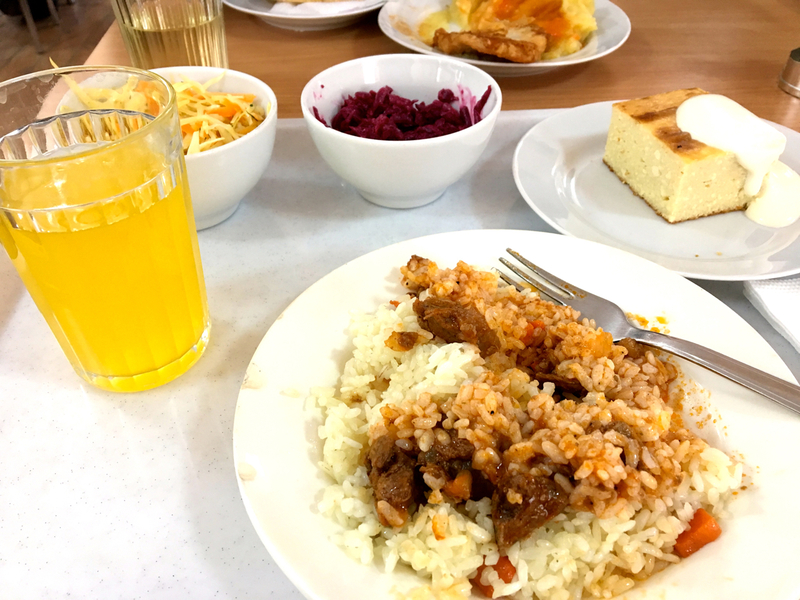 Goulash and rice, pictured with cabbage slaw, beet slaw, and a kind of "cheesecake"
As you can see in the above photos, vegetables usually come in the form of small chopped/shredded salads on the side. The meat is usually served atop rice, barley, or mashed potatoes. Once in a while you can get "home-style" potatoes or cooked cabbage instead. One of our favorite places to eat is the university cafeteria. Yeah, you read that right. 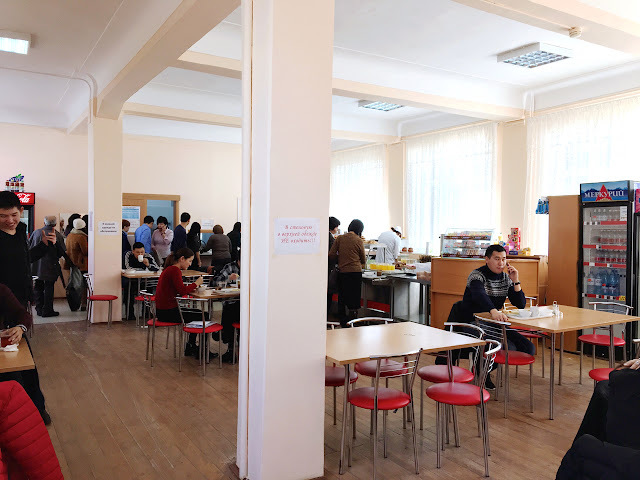 Unlike most American cafeterias, the cafeteria food here is cheap, excellent, and tastes "just like home" (we've been told by the locals). The smells from the university cafeteria hit you as soon as you enter the front door of the main building. After this trip, I will probably always associate the smell of dill with Kalmyk State University. The basic cafeteria routine is: (1) Choose a side salad: cabbage slaw, Korean-style carrots, shredded beat salad, "crab" salad, or a kind of potato/cabbage/beet/pea salad; (2) Choose your base: mashed potatoes, rice, pilaf (rice containing chunks of lamb), or barley; (3) Choose your meat: sausage, cutlet, meatballs, or goulash. Oh, you can also get lamb stroganoff. two slaws, a plate of rice with sausage, a plate of lamb stroganoff, and a juice box. 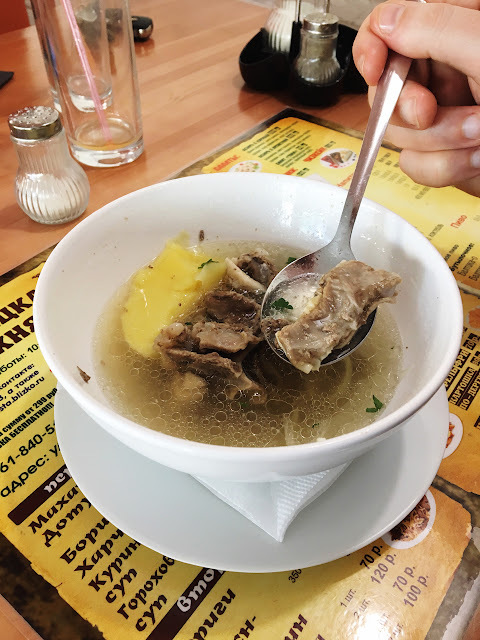 You can also get a bowl of borsch (which is not beet-based here - it's cabbage-based) or chicken noodle soup, garnished with sour cream if you'd like. Finally, there are many pastries to choose from, including potato-stuffed pies (pirozhki), sugared cookie-like pastries, pig-in-a-blanket, or plain bread, all of which are eaten at room temperature. There's plenty more to write about, but I'll save it for another post. Anyway, it's almost lunch time here, and Ted's getting HUNGRAY! So you're going to open the first Kalmyk restaurant in Fayetteville? I can't believe how cheap that food is! Looks delish!